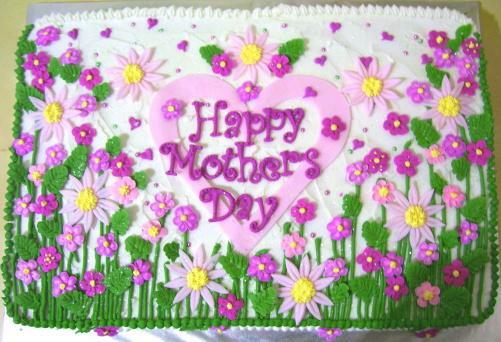 Bake and decorate a cake for Mom that makes her day special. When it comes to Mother's Day, you should create something that shows Mom how you feel about her. 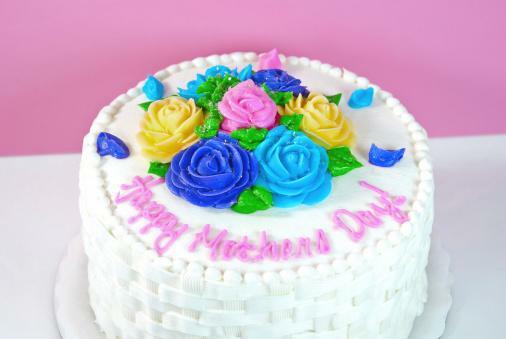 Make a simple yet lovely embellished cake for Mom. This is perfect for sharing with just a couple people or if you plan to have additional desserts at your Mother's Day celebration. Frost the cake with pastel yellow buttercream, making sure to smooth the sides. Use a small round tip with melted white chocolate in a very pale yellow to create the curled "s" shaped embellishments around the top edges, putting a small heart between each one. Use a large round tip to make the bottom border with additional darker yellow buttercream, angling the icing bag at 90 degrees and then pulling and releasing. To make the center decoration, start with a white chocolate heart-shaped disk. Use the same small round tip and melted chocolate to write "Mom" on the top in your best handwriting. Allow the name to set and then put a large dab of buttercream on top of the cake. Prop the heart on top of the buttercream and lightly press down. Moms who love gardening will enjoy this spring cake. If she isn't a fan of pink and purple, feel free to use whatever her favorite colors are for the flowers. Start with a basic white frosted sheet cake. Cut out a pink fondant heart for the center; you'll make the garden flower decocrations around this. Use a round tip with green buttercream to make flower stems at varying heights so the heart is surrounded. Tint additional buttercream with pink and purple shades to make the flower petals. Have two sizes of petal tips on hand to make varying sizes of blossoms, then fill the center with a dot of yellow buttercream. Cut the daisy leaves out of the same pink fondant you used for the heart and add the yellow center with buttercream. Add green buttercream leaves throughout to keep the garden looking realistic. Add a few small purple hearts at the top of the cake, plus a white border on the top and a round dot border on the bottom and sides. 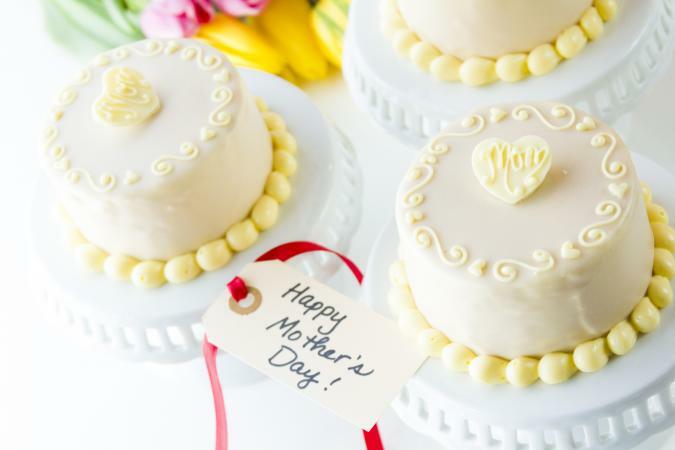 Finish with a Mother's Day message in your best handwriting or fondant lettering. Not every cake has to say "Happy Mother's Day" in order to celebrate Mom. 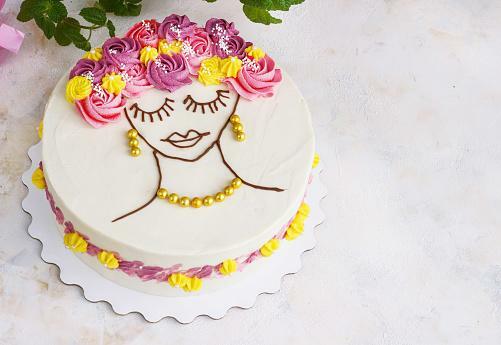 Instead, show her how wonderful you think she is with a cake that highlights her beauty. Start with a frosted white buttercream cake. Make an outline of your mom's face using chocolate buttercream or melted chocolate. Make sure you have her neck, lips, mouth, and eyes, as well as her basic face shape. Fit an icing bag with a large star tip and another icing bag with a slightly smaller star tip. Go with pink and purple or select Mom's favorite colors. Pipe rosettes across the top of Mom's face, going back and forth between the two bags. To make a rosette, start with the bag in the center of the rose. Squeeze and then pull the bag out, slowly circling your initial dab of frosting until your rosette is complete. Fit a small star tip onto a bag filled with yellow buttercream and dab small stars or rosettes in any spaces where there's a gap. Add small white round sprinkles to the flower hair. Use edible gold dragees to create earrings and necklace in a shape that resembles your mom's typical jewelry. Finally, add a yellow and purple floral border around the sides of the cake. A classic cake design is basketweave with roses. It's the perfect design for a mom or grandma who enjoys traditional things in life. Frosting a round cake with white buttercream. Making icing roses and allow them to set. Working slowly and carefully, use the basketweave piping technique to create the sides of the cake. Add a round dot border on top of the basketweave design to outline the edge of the cake. Move the icing roses to the center of the cake and add buttercream leaves. Write your Mother's Day message below the roses using a round tip and thinned buttercream frosting. A delicious dessert is a great way to thank Mom for all she does on this special day. Follow the instructions with the Mother's Day cake pictures to help your design come out just right for the most wonderful woman in the world.